Our service is called Mobile Impossible. It's an sms-service for recieving fun mini adventures via sms. The small fee is 3 SEK for each adventure. On MobileImpossible.se the user can see his track record, compare it with other users' and comment on missions. Hopefully we will manage to build some kind of community around the service. The service is run on a LAMP installation at Binero and using Telenor Mobilstart for the sms payment solution. We recieve money every time a user asks for a new fun adventure via sms. We need help inventing fun mini-adventures! 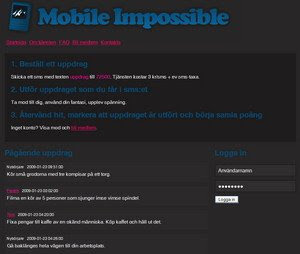 Go to MobileImpossible.se and let us know what you want other people to do. The people behind the service are Magnus, Fredrik, Daniel and Tore from Linköping.